I recently had the great pleasure of testing out and reviewing some organic take and bake cookies from The Immaculate Baking Co.! Was I ever excited to try these! These cookies contain no high fructose corn syrup, no trans-fats, no bleached flour, and no hormones in the milk & eggs. Just real ingredients. In 1995, Scott started the company in his garage with only a couple thousand dollars, some used ovens, and one goal in mind: wholesome food celebrating the creativity of American Folk Artists. A few years went by and he upgraded to a bakery as the demand for his cookies grew. Scott is also an avid collector of folk art and all of his packaging reflects it as he includes it on all of his products, and the company even sponsors local artists and programs. What I find so interesting is that Scott is so involved with his company, and the food industry, that he is actually still the one to come up with all the new recipes! I was sent all 5 flavors of the take and bake cookies, (Chocolate Chunk, Vanilla Sugar, Triple Chocolate Chunk, Oatmeal Raisin and Peanut Butter) and started out with the Chocolate Chunk. These cookies tasted fabulous with just the right amount of sweetness without it being overpowering. The directions were perfect for my ovens settings as they took the 14 minutes of the 10-14 recommended. After letting set on the pan for about 2 minutes, they were perfectly browned and yet still quite chewy. And my husband ate as many as I did, which is very unusual since he normally doesn't like cookies. Next we tried the Vanilla Sugar. 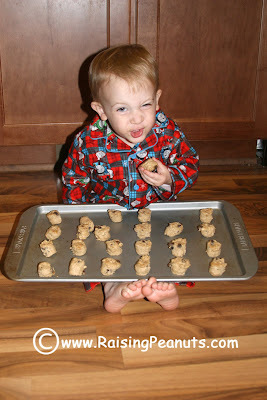 I hate to admit it, but we actually baked these the day after the Chocolate Chunk since we had already eaten them all! These were again fabulous, exactly how you'd think a vanilla sugar cookie should taste. But being a chocolate fan myself, these were great - but not like the chocolate chunk! 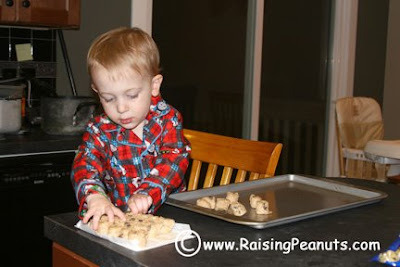 A few days later Todd decided we needed some more cookies in the house (again - unusual!) and made the peanut butter cookies. BY HIMSELF! That's right, my husband made cookies all by himself and they again turned out perfect. They tasted the best with a nice cup of milk to go along side them! Next were the Triple Chocolate Chunk, and I have to tell you, I was in heaven!! These were my favorite by far! Super chocolaty but the sweetness wasn't overpowering, just a fabulous mix. And last but not least, we made the oatmeal raisin cookies. Wait, let me clarify. My two year old son made the cookies. Oh yes, my son. You can "make" the cookies! We pulled up a chair to the counter and he got to place them all out on the cookie sheet) and then I of course placed them where they needed to go). Cause you know, two year olds aren't the best at spacing! We would have had one GIANT cookie. Trying to get in a taste before they hit the oven! These cookies were fabulous! I can't say anymore than that. They baked perfectly and tasted perfect as well. I can understand why Scott's cookies are winning awards. They are also super easy to make, just break apart and toss on a pan. And it just wouldn't be a full review if I didn't let you know they taste awesome un-baked too. :-) I know, you're not supposed to eat raw cookie dough, but I couldn't resist! I am also super excited that I saw these in the cooler section of our local health food store. While at $4.50 or so a package (MSRP is actually $3.49 - $3.99 so our store inflates a little bit. Or a lot of bit. Hmm...) they are well worth the occasional treat. Especially since I normally don't bake any sweets at all at home. I can pronounce and understand all of the ingredients listed, and they use mostly organic (I believe 3 of them are 100% organic, the other 2 were 74% organic) ingredients, no preservatives, no trans fats, and no artificial flavorings. I even feel completely fine letting my two year old indulge just a little bit with these. You need to find these and try them! Loved them. And like I said, very unusual for him since he doesn't really go for the sweet treats at all! He actually told me I should pick more up sometime. "More! More!" is all he kept saying when he saw these. While he only got a couple of each, he enjoyed them all immensely. What a special treat for him! And he thought it was the coolest thing to make his own cookies. The Immaculate Baking Co. website is also fun to poke around in. 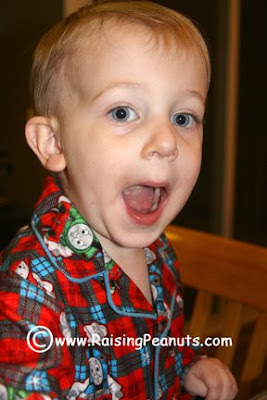 There are lots of different fun things to see and e-cards to send, and information on the local programs they support. They even have a whole page about Folk Art and the artists whose work they show. I was all excited that I might be able to try these, and then realized that you aren't a gluten free blogger, so while everything else is good, I still can't have the flour in them! Darn. Back to baking my own gluten free versions.